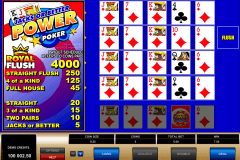 Jacks or Better by Playtech is a free video poker variation of the Jacks or Better video poker type. This particular game is simple and looks very predictable, however, we are going to investigate deeply players choose this game for gambling in Playtech casinos. Basically, this game is played with a 52-card deck and features no wild cards. A pair of Jacks is the lowest combo according to the title of the game. 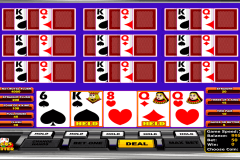 The payout table is located at the top of the gaming screen. The maximal payout is 4000 for the Royal Flush. The maximal bet is 5 and the minimal one is 1. You should choose your wager and press Deal to start a round. You will be dealt five random cards which can be then discarded or held in order to build up winning combos. The next step is to press Draw and look if you get any strong hand. Your goal is to build the strongest possible hand. The lack of decisions in this video poker leaves no other aim. 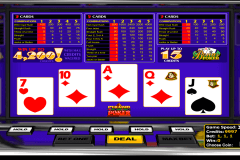 Casino games mainly have gambling features to make basic games somehow more interesting. 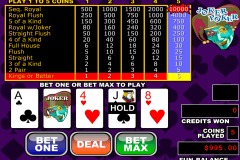 In this case, we are offered the doubling bonus round which is implemented nearly into all the video poker games. You can double up your winnings or leave a half to your balance and double the other half in this case. This gambling round is about to pick one card between four down-faced cards which will have a bigger value than the up-faced card. The RNG is not very satisfying, though. The overall impression is positive due to a good RTP. Jacks or Better by Playtech, however, has a lack of great design and dynamic animations. The gambling feature is absolutely average. Anyways, a good game to play online.